Kenny pictured at the Aviva Stadium on Monday. 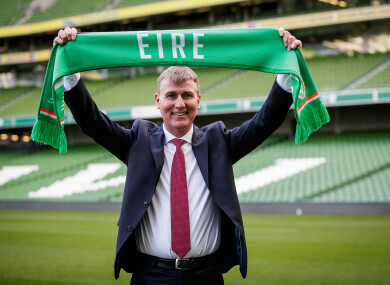 DUNDALK HAVE BROKEN their silence over the departure of Stephen Kenny, with the League of Ireland champions congratulating the Dubliner on his new appointment as Ireland U21 manager, before taking over as senior boss in 2020. The FAI confirmed the appointment of Kenny as U21 boss yesterday afternoon, describing him as “one of the best managers in Irish footballing history”. He will succeed Mick McCarthy after Euro 2020, with Kenny confirming during his unveiling on Monday that it was “in writing” he would take over from McCarthy in August 2020. Kenny was hired as Dundalk manager at the end of 2012 and led the Lilywhites from the brink of extinction to the Europa League group stages, collecting four league titles in six seasons along the way during a tenure of sustained success. The 47-year-old has secured two doubles over the past four seasons and departs the Louth side having clinched both the SSE Airtricity League Premier Division and FAI Cup in 2018. “Dundalk FC wishes to congratulate Stephen Kenny on his appointment to be the Republic of Ireland Manager in 2020,” the League of Ireland champions said on Monday afternoon. “The Club would like to take this occasion to thank Stephen Kenny for driving the amazing success achieved during his tenure. Kenny was presented as Ireland U21 manager at the Aviva Stadium earlier today, describing the job as “a privilege” and one which he could not turn down despite enjoying incredible success with Dundalk over the past six years. “It was a huge wrench to leave the club,” he said. Email “Dundalk thank Stephen Kenny 'for driving amazing success' as manager departs Oriel Park”. Feedback on “Dundalk thank Stephen Kenny 'for driving amazing success' as manager departs Oriel Park”.